Search engine marketing (SEM) involves using keywords, calls to action, and compelling copy to advertise on search engines like Google. 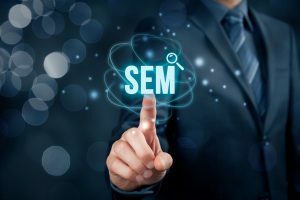 Although often confused with search engine optimization, SEM doesn’t involve improving organic search results with SEO. Rather, it consists of paid search. Here’s how search engine marketing can help your auto dealership be an effective selling force in your industry. Search engine marketing helps you get noticed by interested potential buyers. Even if you’re the best dealership in your neighbourhood, town, city, or province, every business can always benefit from more attention. With SEM, you’ll show up at the top of related searches above your competition and appear before relevant audiences online. The age of general keywords is long over; now it’s time to get hyper specific. This way, you’ll be targeting specific searches. “Lime green convertible used in Toronto” may not be a common search term, but when it’s searched, you can ensure your dealership’s paid ad shows up first on the list of results. Start with what you do have on your lot. Get those long-tail keywords into your digital repertoire and you will likely increase the number of qualified leads you get on your auto dealer website. Selling is all about building relationships, trust, and respect. A very good way to do this is to appear as an expert in your industry. With search engine marketing, you can help ensure your name keeps appearing on all things related to what you do. How to buy a car? There you are. Searching for a particular model, used? There you are. What are bad sounds to hear coming from your engine (and what they likely mean)? You’re the top result again. You can use paid search to not only improve conversions, but also to generate more traffic to your website and improve your brand awareness. Being the expert means people will be more likely to trust you, which you can eventually turn into purchases down the line. Search engine marketing is an integral part of a complete digital marketing strategy. To ensure its success, you must be strategic and use it as part of a holistic marketing plan. Search engine marketing is one of your best friends as a dealership owner. It’s like the friend at a party who knows everyone and can introduce you to the people you’re really going to get along with. Learn to leverage it well and you’ll have the opportunity to see an incredible increase in your revenue and lot success as more people get to know your dealership and convert to happy customers.